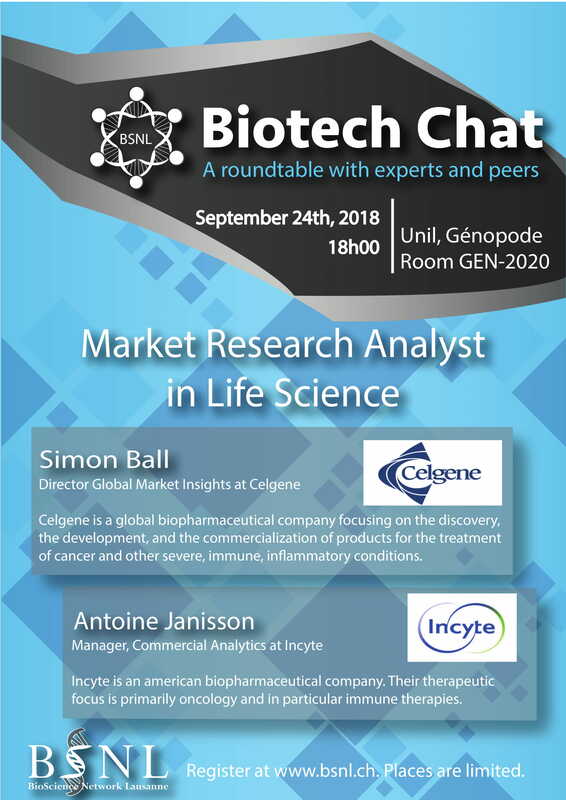 Are you interested to learn more about career opportunities for Life Scientists in Market Analysis? Are you curious to understand what it means to work on market research, market intelligence, market insights, market analytics and competitive intelligence? an event organized by the BioScience Network Lausanne (BSNL)! BSNL Biotech Chats are career and networking events where experts and peers can exchange their ideas and experiences in an informal setting. They offer a unique opportunity to get first-hand insights into various professions in Life Sciences, which may help to discover your own prospective career paths. Simon Ball gained a PhD in Neuroscience from University of Bristol before moving into the field of Pharmaceutical Market Research in 2006. In 2010 he joined Celgene and has subsequently held several positions of increasing responsibility within the Market Insights team. He is currently working as Director of Global Market Insights focusing on Hematology and Oncology based in Boudry Switzerland. Antoine Janisson started his career in 2006 when he joined Merck as R&D training systems manager where he also became a senior market analyst in 2010. In 2017, he moved to Incyte where he is currently working as manager commercial analytics. WHERE: Génopode building, room GEN-2020 on the UNIL Sorge campus. Each Biotech Chat is followed by an apéro to give you a chance to discuss and network with the speakers and the participants. For organizational reasons, please register here to attend the event.